On Sunday, I was aboard only the fourth special rare-mileage trip that Amtrak has operated and offered to the public on its own (as opposed to operating charter trips for which tickets are sold by another entity, usually a railroad historical society), each of which sold out quickly — three sold out within a few hours of tickets becoming available. This was Amtrak’s second annual Autumn Express Train. The trip took nine and a half hours round-trip to cover 240 mostly rare miles, with no intermediate fresh air stops, and I enjoyed the ride along with close to 1,000 fellow passengers. Autumn Express passengers fill the rearmost of 13 Amfleet I coaches on Sunday, Nov. 9. Photo by Malcolm Kenton. Both trips operated on the second Saturday and Sunday of November out of Philadelphia’s 30th Street Station. Last year’s run (on which I was also aboard) traversed Norfolk Southern’s ex-Pennsylvania Railroad Port Road Branch on the banks of the Susquehanna River and the short connection from Columbia to Lancaster, PA, as well as passing through NS’s Enola Yard and over the Rockville Bridge over the Susquehanna west of Harrisburg. This year’s Autumn Express utilized one of America’s oldest railroads: NS’s ex-Reading Company line between Philadelphia and Harrisburg via Reading (opened in 1842), as well as two CSX segments through Philly, turning around over the Rockville Bridge as a leg of a wye. Last year’s consist was ten Horizon coaches, brought to Philly from Chicago, and two Amfleet I cafe cars, while this year’s was a 16-car all-Amfleet I set with two cafe cars, a set that is generally kept together during the fall for special trips. Both were pulled by two P42 diesels and were trailed by the Metroliner 9800 club car, one of the original 1967 Metroliner cab cars, which served as a crew lounge. This year’s power was the veterans’ locomotive, no. 42, and the bloody-nosed heritage unit, no. 156. Bruce Van Sant, Amtrak’s Director of System Operations who was responsible for organizing the trip, boasted over the P.A. that the train was 0.27 miles long. When it pulled out over the Rockville Bridge, it occupied the entire span. Both trips were staffed primarily by Amtrak management employees from across the country who volunteered to serve as car hosts (one for each coach), souvenir sellers, and in other supporting roles, responding to company-wide internal emails. One of this year’s car hosts told me that they actually got responses from more employees than there was a need for, and the employees on board were enjoying the chance to interact with passengers who were knowledgable about the railroad. The car hosts handed out two-sided “points of interest” sheets listing the towns traversed, the three tunnels, and other points by mileage from Philadelphia (based on the original Reading mileposts, visible from the right-hand side of the train). Each passenger also got a souvenir cushioned tote bag with a Jersey Mike’s sub, a bag of Lay’s chips, a chocolate chip cookie and a bottled water — all included in the $129.00 fare. The Reading, PA skyline and Schuylkill River, seen from the NS's ex-Reading RR high trestle connecting Reading to Wyomissing, PA, on Amtrak's Autumn Express. Photo by Malcolm Kenton. Throughout the journey, Van Sant announced upcoming points of interest and offered both historical and current trivia about the points along the route over the P.A. system. He also pointed out the three major Norfolk Southern yards we passed by, including the Rutherford Yard, which was recently expanded to handle a greater volume of intermodal container traffic, primarily traversing the I-81 corridor to the southeast. Van Sant repeatedly thanked NS and CSX for hosting the excursion and working it into a busy freight schedule on the ex-Reading main line. The Autumn Express Trains mark the first time in recent memory that Amtrak has intentionally marketed to its devotees and to train travel aficionados (like myself) looking to experience travel on routes that haven’t seen regularly-scheduled passenger train service in decades. Van Sant said last year’s trips “did well” financially, though would not give any specific numbers. A total of nearly 1,700 rode both trips last year. Judging by the tremendous success of these excursions, one is left to wonder why Amtrak doesn’t put together this kind of trip more often, in different parts of the country. At the completion of each Autumn Express trip, this year and last, the car hosts handed out cards asking passengers to participate in an online survey about what attracted them to this trip and when and where they would like to see future special trips operate. Both surveys offered several potential route options and also had an open-ended question allowing respondents to mention other routings they’d like to see offered. Among the options included this year were a 3-day ski train package (including hotel and ski resort tickets) from Philadelphia to central Vermont over the Vermonter route, and a single-day round-trip wine and cheese-tasting excursion from Philadelphia to Lynchburg, VA. I do not have access to the results of these surveys, but I am willing to venture that they demonstrate strong interest in specials using various itineraries. Philadelphia's 30th Street Station, seen from the Autumn Express Train traversing CSX's ex-Pennsy High Line, a usually freight-only bypass. Photo by Malcolm Kenton. Sunday’s trip benefitted from crystal-clear fall weather, although leaf color was a little past its peak for much of the route. The scenery was not spectacular, though the Schuylkill Valley and the farmland west of Reading were pleasant, but there was enough to maintain my interest. I enjoyed a glimpse from the rail perspective (which gives you a different sense of a place than driving through it) of small towns that don’t often see passenger trains, particularly observing the condition of their depots, most of which looked to be in good shape and used in one way or another. A full description of the route is below. I spoke to several of my fellow passengers in the rearmost of two cafe cars. Only one was unhappy. Margaret Durkin had expected more spectacular fall foliage and more impressive scenery, and were frustrated by the length of the trip and by seeing “mostly train yards.” The vast majority, however, were having a good time. Only a handful appeared to be hard-core mileage collectors, though. 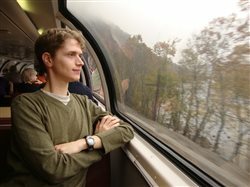 Most were people who simply enjoy riding trains every so often and were attracted by the novelty of seeing some different places by train. Janice and John Turner, a young couple, told me they had never ridden a train in the US, but had done so in Europe. They found out about the Autumn Express from friends and decided to try it out. Brandon and Diane Kovatch of Palmyra enjoyed the chance to ride a train through their hometown. They used to ride trains more often, to Philly and to Chicago. They said they would probably climb aboard more often if there were regular passenger service on the ex-Reading line. Brandon, who works near Reading, might even be able to use it to commute. This was Brandon’s second trip over the line — he got to take one of Conrail’s last Operation Lifesaver excursions in 1999. The recently-restored historic Reading Company depot in Wernersville, PA, seen from Amtrak's Autumn Express Train on Nov. 9. Photo by Malcolm Kenton. As we re-entered Philadelphia behind schedule, several passengers worried about missing connecting trains home towards New York or Washington. Unlike last year, however, Amtrak coordinated the Autumn Express with other trains in the reservation system, and a DC-bound Northeast Regional was even held across the platform awaiting our arrival. Trips like the Autumn Express certainly involve a great deal of planning and preparation and some not-insignificant expenses, but it obviously does not take a widespread marketing effort to fill them up. It would be great — certainly for us travelers, but also potentially for the perennially beleaguered company’s bottom line — if Amtrak would arrange this kind of excursion more often, and throughout the Lower 48. My photos from Sunday’s Autumn Express are available here, in my Flickr photostream. Follow along with me as I return to the Keystone State this Saturday (Nov. 15) to ride another part of the former Reading Railroad via an excursion between Pottsville and Reading, operated by the Lehigh Gorge Scenic Railway over the short-line Reading, Blue Mountain and Northern Railroad, with a stop at Port Clinton to tour the RBM&N’s headquarters. The trip was originally supposed to be run with two ex-Reading Budd-built Rail Diesel Cars (RDCs), but due to mechanical issues with the RDCs, will instead use three of the LGSR’s 1920s-built heavyweight coaches hauled by two diesel locomotives. The RBM&N is a uniquely passenger-friendly short line, to which the LGSR is a sister company, and I look forward to sampling its service and speaking with its employees and management. The train began by backing out of 30th Street Station (with locomotives on the north end) at 9:50 AM and making two reverse moves to access CSX’s ex-Baltimore & Ohio line (including taking us over the normally freight-only CSX bridge over the Northeast Corridor in southwest Philly). It then moved forward across the Schuylkill River and passed 30th Street Station on the river’s east bank, the route of B&O’s Royal Blue which had not seen a regular passenger train since 1958. After tunneling under the Philadelphia Art Museum’s Aikens Oval (on the lower of two bores, the upper of which once carried streetcars) and the NEC, we crossed the river again and made our way onto NS’s ex-Reading line on the south bank of the Schuylkill, which even in the days of Reading Railroad passenger service was freight-only. And, of course, there was no regular passenger service that connected from the Reading line into 30th Street Station, as all Reading trains went to the Reading Terminal in Center City (near where SEPTA’s Market East station is now). The small depot at Valley Forge National Historic Park, once served by Reading commuter trains but still used as a visitors' center, from Amtrak's Autumn Express on Nov. 9. Photo by Malcolm Kenton. The excursion continued northwest through the Schuylkill Valley towns of West Conshohocken, Bridgeport (across the river from Norristown), Valley Forge National Historical Park, and Pottstown at a top speed of 40 mph. In the process, the train traversed two 180-plus-year-old tunnels, Flat Rock Tunnel (near West Conshohocken, opened in 1840 and widened in 1859) and Black Rock Tunnel (just east of Pottstown, opened in 1838). We entered the heart of downtown Reading at about 1:00 PM and passed the original Reading RR depot, which is now a local and intercity bus hub. The section from Bridgeport (CP Norris) to Reading had not seen a scheduled passenger train since the Reading discontinued its DMU commuter service between Philly and Pottsville in 1981. After crossing the Schuylkill for the fourth time, we made a beeline for Harrisburg, topping out at 55 mph, via a series of small towns (among them Robesonia, Womelsdorf, Lebanon, and Anneville), many with their old Reading depots still standing and used for other purposes, from restaurants to visitors’ centers to model train shops. The Reading-Harrisburg segment had not seen scheduled passenger trains since the 1950s. We passed through Hershey, “the sweetest town in America,” within sight of Hershey Park with its several roller coasters and underneath the park’s monorail line. Upon arriving in Harrisburg just after 3:00 PM, the Autumn Express passed by the ex-Pennsy Amtrak station’s historic train shed and, after waiting for the on-time westbound Pennsylvanian to pass, followed it onto the picturesque Rockville Bridge, the world’s longest stone masonry arch railroad viaduct. We stopped for a minute or two on the bridge, then went in reverse and turned westward, then moved forward and eastward to complete the turn on the wye. We returned by the same route, reaching Reading at dusk (about 5:00 PM). Instead of going back through downtown, we used NS’s shorter cutoff route, bypassing downtown to the south (which never saw regular passenger service) and rejoining the previous route. Arriving back in Philly around 7:00 PM, we stayed on the Schuylkill’s west bank, entered Zoo Interlocking (next to the Philadelphia Zoo), then peeled off of the NEC onto CSX’s ex-Pennsy “High Line,” which passes just west of 30th Street Station on a large elevated right-of-way held up by stone pillars. Note that Saturday’s trip used the High Line in both directions, so Sunday’s use of the B&O route on the Schuylkill’s east bank, necessitated by track work CSX was performing on the High Line, was particularly special. The last scheduled passenger service on it was pre-Amtrak Penn Central Metroliners that ran nonstop between New York and Washington and used it to bypass 30th Street (the supports for the catenary that once fed GG1s and Metroliners on the High Line are still in place). This gave passengers a spectacular view of the Philadelphia skyline and of 30th Street Station from the left side of the train, and the University of Pennsylvania campus from the right side. We then inched our way across and down onto the NEC, then backed into the station around 7:30 PM, a half hour later than advertised.